Our promise: to treat patients respectfully and compassionately, and to provide first-class evaluation, consultation, and support services. We have been serving patients since 2012 and help with the entire process of obtaining a medical marijuana card, including the state's online registration process. Nobody can beat our service and certainly not our prices. We also will beat any of our competitor's deals/coupons for all types of evaluations, whether standard or extended. Guaranteed! Whether it is through our mobile apps, educational events, web content, or consultations, we provide educational support to make your medical cannabis journey a success. Schedule your appointment below or simply text us your preferred date and time and you will receive a text back to confirm your medical marijuana evaluation (719) 246-0393. When it comes to finding medical marijuana (MMJ) doctors in Colorado Springs or Pueblo you can trust Dr. Bruce Reimers, and the helpful and professional staff at Medical Alternatives Clinic. At Medical Alternatives Clinic, our number one priority is helping patients achieve the highest level of wellness possible. If the physician you see determines you are a good candidate for treatment with medical marijuana, we will assist you in all aspects of state paperwork to obtain your Colorado Medical Marijuana Registry Card. Our dedicated and compassionate professionals will ensure that your health concerns regarding the use of medical marijuana are addressed, a treatment plan is devised, and you will leave your medical marijuana evaluation educated about how to appreciate the most benefit from medical marijuana. Stop wondering what medical marijuana’s benefits can do for you and come see Dr. Reimers today! Medical marijuana is safe and effective, and we stand behind growing scientific evidence that supports its use as a medical alternative, especially for patients suffering from debilitating and chronic conditions. We know it can be difficult to find consistent and reliable professional medical marijuana doctors in Colorado Springs and Pueblo. Our clinic is owned and operated by a local physician who has practiced medicine in Colorado Springs since 1975. Our friendly and knowledgeable MMJ doctors and staff will help to get you the proper evaluation to receive your medical marijuana card. We will provide information about Colorado state laws and regulations for MMJ, providing you the tools and guidance you need in order to obtain a Colorado Medical Marijuana license. Call our MMJ Doctors in Colorado Spring and Pueblo Today at (719) 246-0393 to Schedule your Medical Marijuana Evaluation! At Medical Alternatives Clinic, we strive to make the process of applying for the Colorado State Medical Marijuana Registry as affordable, informative, and pleasant as possible. Bruce Reimers, MD, our highly qualified local physician, will assist you by devising a personalized treatment plan if Medical Marijuana (MMJ) is deemed to be helpful for you. Once you have scheduled an MMJ appointment with us and come in for your medical marijuana evaluation at the Colorado Springs or Pueblo clinic, we will provide you with all state required paperwork. This includes the pre-addressed envelope for sending forms for your convenience as well as a free onsite notary to complete your application. Colorado law mandates the clinic cannot mail your application. We highly recommend you send your application via certified, return receipt requested mail. Whether you’re registering for the first time or applying for renewal, Colorado MMJ rules are constantly changing and our staff stays current on the rules and regulations. Schedule an appointment with Dr. Reimers today using our online scheduling calendar! Medical Alternatives Clinics promises to present you with the best options for improving your health and quality of life with MMJ. As one of the best medical marijuana doctors Colorado Springs and Pueblo have to offer, Dr. Reimers believes continuity of care is important. Follow up visits and phone calls are encouraged to promote adjustment to your treatment plan as needed. Learn more about our medical marijuana doctors in Colorado Springs and Pueblo today. 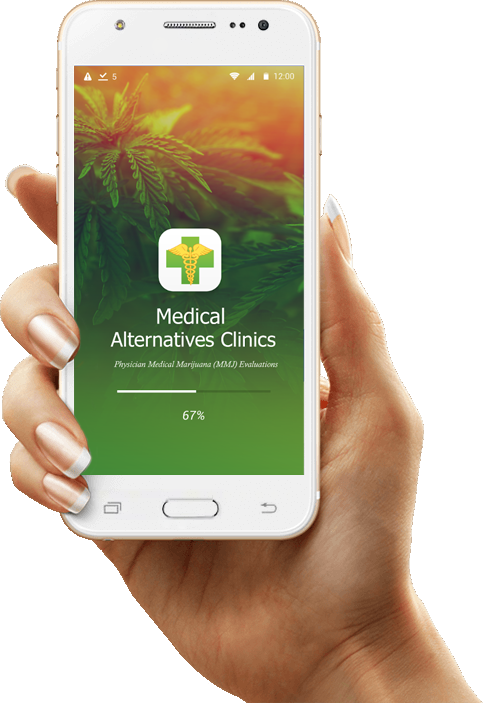 Download the Medical Alternatives Clinics mobile app for Android and iOS!